Made to Order: Because the Palliser Model 41458 Vox Series is custom made to order, you get to choose from over 100 leather and microfiber colors, and 4 foot finishes. Chairs are delivered to you by our in-home delivery service with Free White Glove Delivery and set-up on all order of 2 seats or more (normal delivery is 5 - 6 weeks). The Palliser Vox Series home theater seating combines unparalleled comfort, sophisticated design and all the features you need to help create the ultimate home theater. This custom modular system is available in straight or curved configurations. You can customize to fit your family size and living space with as many seats across as you need. The Vox's "wall hugger" design means seats can be placed only 4 inches from a wall and still fully recline. Luxurious, ergonomically designed seating surfaces are sculpted from high resiliency foam over an all steel frame using No Sag Spring Suspension for superior comfort and support. The Vox Series is as comfortable as any cinema seating made. 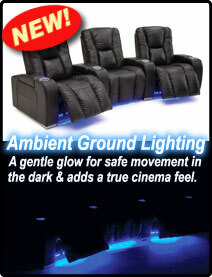 It is an elegant addition to your home cinema and is an excellent investment in comfort and quality. Available options include Full Power Recline, Standard or Wireless Bass Shaker Systems, and leather upgrades (all available at an additional cost). To see how the Vox will fit in your room try the Palliser Room Builder. Optional Bass Shakers allow you to experience every thump, thrust and shake...the way bass sound was originally intended, adding a level of sensation that is amazing. 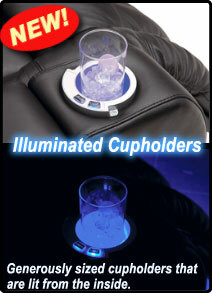 Bass Shakers are specially designed sub woofers that are mounted within the seat. They vibrate during explosive low frequency viewing moments to add an incredible sense of realism. This effect is achieved without an excessively high bass volume. Patented technology preserves the sound pressure levels so there's no distortion while enhancing the bass energy delivered from your Vox. They are also great for heavy bass music and video games.